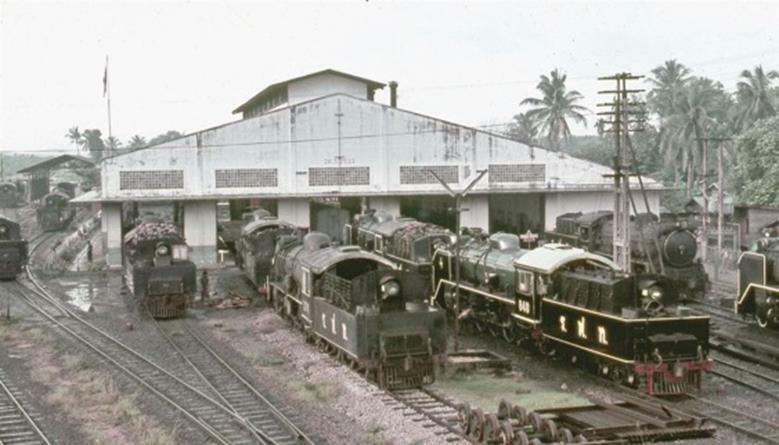 Thailand ceased steam operations in the 1970s, and not to many rail fans visited there or took photos. Fortunately, a friend of mine, who spent a week there, was kind enough to share this story with us. Please enjoy the photos and information, including a 3 cylinder pacific – a gem from that part of the world. 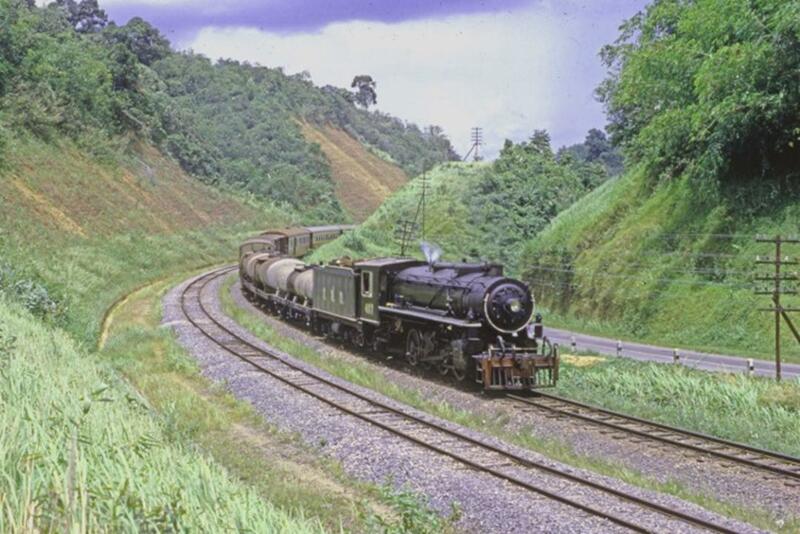 Aussie Dennis Mitchell recalls a trip he mad to Malaysia in 1973, to catch the last of regular steam action. 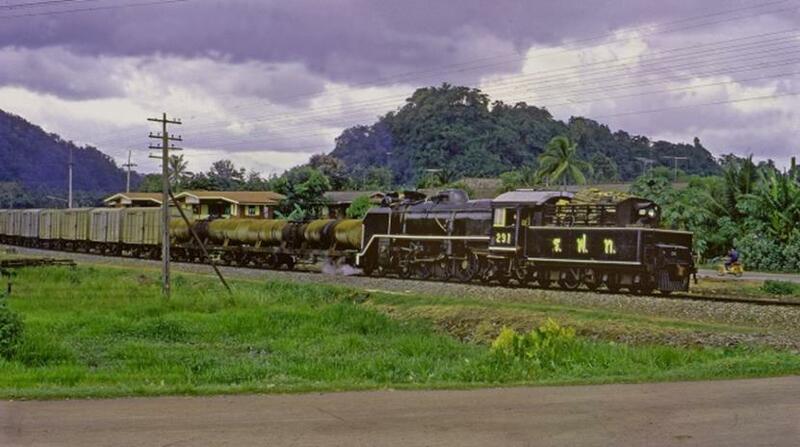 In 1973, we visited Thailand by rail 2 days late after being stuck in Medan North Sumatra, on Independence day, where EVERYTHING stops; no planes, no telephone operators , no buses,trains etc. We did cajole a taxi driver to take us to Pamelang Susu? to what should have been the southern extremity of the Aceh tramway, but it was abandoned and trains hadn’t run for some time.The cabbie didn’t want to go further north because it was Banda territory, and they apparently weren’t too keen on outsiders. Eventually we got away on the 18/08 to Penang , and Butterworth, Malaya ,where after a lot of arguing with the Station Master we procured seats for the next morning’s railmotor to HaadYaai in Thailand. We then went back by steam ferry toGeorgetownPenang, to our hotel. Next morning we left very early. 3:30 am comes to mind! We travelled by rickshaw, and steam ferry to Butterworth to catch the 5:30 am Budd Car to HaadYaai. After the border check we saw our first Thai steam, 1949 built Nippon Sharyo Mikado 912. We then passed steam at every crossing loop to HaadYaai. 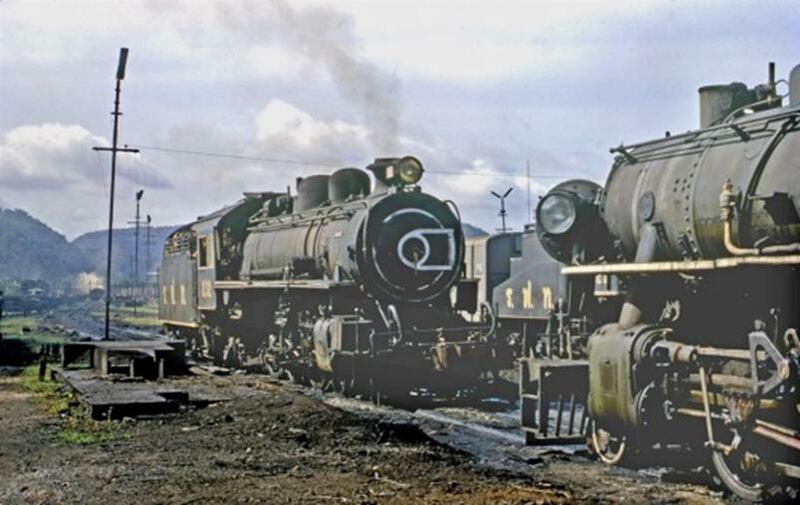 This was a major loco depot with four classes of steam, the Japanese 270 4-6-2 of 1942/3 .the 800 class 4-6-2 of 1950 by various Japanese builders including Kawasaki, the 1942, 300class 2-8-2 and the 1949 class 900’s 2-8-2s of various Japanese builders. The locos were a combination of oil and wood fired (some of the wood burners receiving a second life due to the oil crisis). 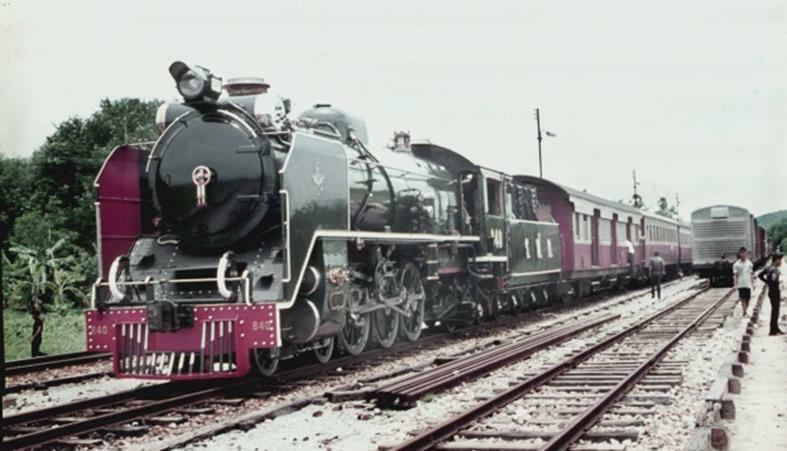 4-6-2 s 840+ 841 were “supershine” locos and were usually on the expresses to Yala+ Tumpat Locos were a mix of oil burners + wood burners [due to oil crisis ,oilys were being converted to wood!. If you look closely at 840; you can see that there was a bit of British Great Western influence.!!! The main scenario appeared to be expresses were handled by diesels (all Japanese built G.M.’s) While the mixed and semi fast passengers were steam worked.That afternoon we travelled by the diesel hauled express to Thung Song where we encountered 2 more classes, the MacArthur Lima/Baldwin/ Alco 2-8-2s similar toQ.R.s AC16, and the 700 class 2-6-0s that came straight from Japan during WWII with thick tyres and wheels (quick conversion from cape gauge to metre). Thung Song Provides A Variety Of Thai Steam LocomotivesOn our first night in Thung Song we didn’t sleep too well; maybe it was the sawmill across the road which appeared to be a 24/7 operation,or maybe it was the MacArthur’s thrashing up and down the yard making up trains (why did Aussies potter about the yard shunting when most of the world’s yards were worked by crews intent on maximum thrash)? This is the midday mixed service from Kang Tang to Thung Song in Southern Thailand. After spending some time (to the bemusement of the locals) recording the shunts we got some sleep, and in the morning after an interesting breakfast, some sort of meat and eggs and noodles, we went down to the loco depot and found an interesting loco we thought we wouldn’t see. One of the 1929 three cylinder Baldwin Pacifics was in steam. We tried to find out where it was going but the language barrier was too great (To quote the ghost train “If it be a natural thing where does it come from; where do it go?”) Anyway we got shots of 232.It appeared to be the last of the class.These locos (6 of 26) were kept specially to work the branch from Thung Song to Kan Tong until the turntable broke in March 1973. By August only 229 and 232 were left I think! On our second morning at Thung Song we decided to catch the local bus up to Chung Khao pass, about 15 kms from Thung Song, to get some lineside shots. The local buses were big Mercs that I thinkwere driven at breakneck speed by ex Kamakazipilots .We tore around the mountain pass until a sudden squeal of brakes and the announcement”Chung Khao, Chung Khao ” we bailed out. Believe it or not this loco is shunting at HAAD YAAI, making up its train for Padang Besar on the Malay border. 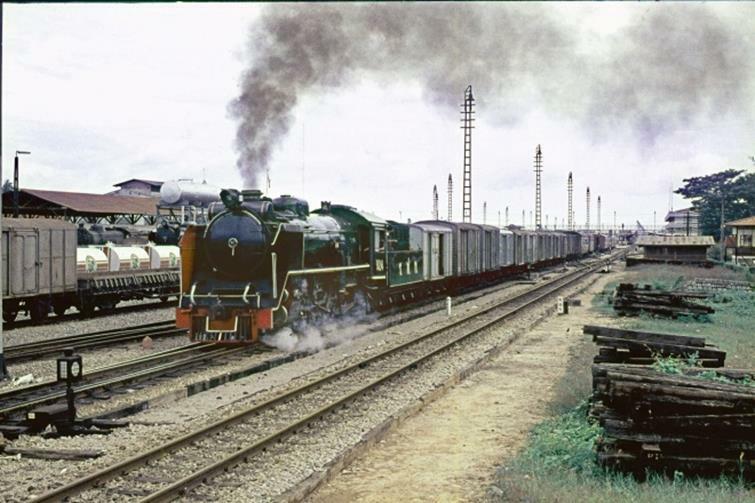 Like most THAI trains, it is a mixed; with about 50/50 freight and passenger cars Loco is one of the Superb 820 class 4-6-2 built by various Japanese builders in 1950/51. After taking a few shots, I was thirsty so decided to get a drink of water from the outside tap of the S.M.s house (unlike most of Asia, Thailand had good health standards). While taking of liquid refreshment, I was confronted by an adult Orangutan who swooped down from the tree next to the S.M.’s. After the initial shock he banged his chest and very gently handed me his enamel mug, and I realized he was the S.M.’s pet (He had a loose long chain around his foot, and he just wanted me to fill his cup with water). Can you guess what was trumps until I worked out what it was all about? After getting some nice shots Allan Tilley and I went back to Thung Song to tell the rest of the group; but by then the sun had changed so we went to a precarious ledge about 30 metres above the track to get a few shots (the steam seemed to be heading the wrong way for decent shots), got one of a grotbox on the international express, (Singapore –Bangkok) So we headed back chuckling about the Orangutan. 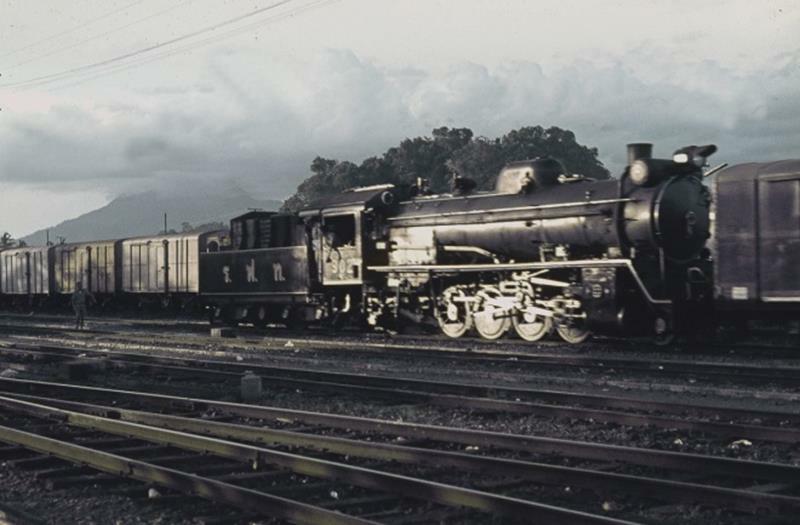 The 700 class Japanese 2-6-0s of 1942/3. These were converted from 3′ 6″ toMetre by widening the tyres on the locos (type of loco used in Kwaai river service Japanese C 56) . I think this made up most of the steam still running in 1973, In hindsight there may have been a 4-6-0 or 2 and maybe a couple of Garratts in the north of the country ; but it was a good enough coverage for us in the limited time available.